I was recently given a Raspberry Pi and had the idea to create a neat desk toy which could connect to the internet and look up inspiring and educational famous quotes. 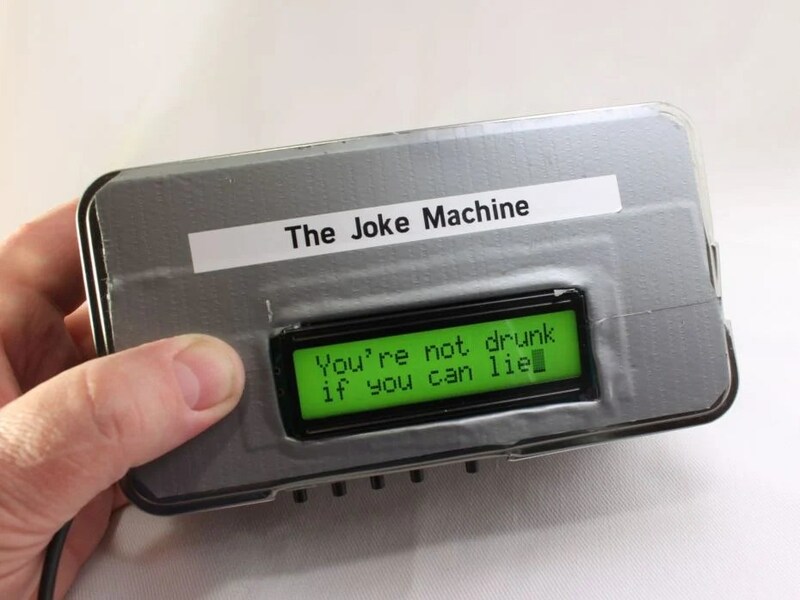 But when I found I could just as easily have it generate one-liners, I decided that would be more fun to build a joke machine. What follows are the details on how you can make your own Internet Connected Raspberry Pi Powered Joke Machine. Once it’s finished, just press the push-buttons and the machine finds one-liners and scrolls through them. I hope you enjoy this project and possibly learn something as well. This project was one of the many excellent entries in our recent Raspberry Pi project contest. WiPi wifi adapter Any USB WiFi card should work, or you can use a wired connection. USB keyboard, HDMI cable and Monitor During setup you'll want to have these all, but they are not necessary once configuration is complete. 4. Optional - How to access your Pi without need for a keyboard or Display using VNC remote access. The Pi arrives with no operating system installed. An easy way to decide which flavor of Linux you want on your Raspberry Pi is to use a NOOBS SD card. NOOBS stands for New Out of the Box Software . You can buy a pre-installed NOOBS SD card (what I used for this project) or download your own from http://www.raspberrypi.org/downloads. First connect an HDMI cable, power adapter and USB keyboard (no ethernet is needed for NOOBS). Change from the default password of pi / raspberry Enable ssh from the advanced options (more about SSH later). Next, run the startx command to bring up the graphical desktop. After the reboot, the Pi will connect to your network and you’ll be able to surf the internet or just sit back and enjoy the nice blue glow the WiPi gives off when it is communicating. Step #4: Optional - How to access your Pi without need for a keyboard or Display using VNC remote access. Client Setup --your laptop or desktop: Download vncviewer for your laptop (or desktop) computer. Connect from your laptop using the IP address and port of the vncserver (and the password you created above) Now you can use VNC even when you don't have a monitor for the Pi, you can either set it up so vncserver starts automatically at boot time (as described later), or connect to the pi by using ssh or winscp, then log on command-line style and start the server. The steps here vary depending on the box you select, but basically: Use a Sharpie to mark where the LCD display should be mounted on the project box lid. Use a tin snips to cut slots in the edge of the project box to make room for the buttons and the power adapter cord. Use a Dremel style tool to cut a hole in the lid of the box (and to smooth out sharp edges). Finally a little tape will really cover any remaining sharp edges. A label machine can be used to label the machine (is that redundant or ironic?). The script can run automatically at startup in several ways, but the following works well download the file "quoteStart.sh" from https://gist.github.com/mazzmn/9422202.